Experimental design is an important component of the scientific method. This book provides guidance on planning efficient investigations. It compiles designs for a wide range of experimental situations not previously found in accessible form. 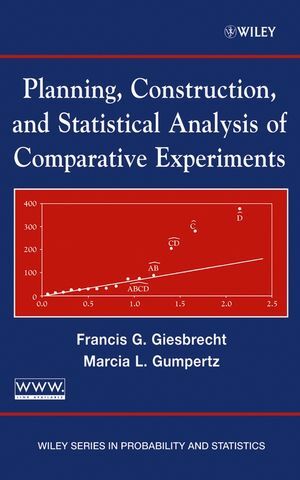 Focusing on applications in the physical, engineering, biological, and social sciences, Planning, Construction, and Statistical Analysis of Comparative Experiments is a valuable guide to designing experiments and correctly analyzing and interpreting the results. The authors draw on their years of experience in the classroom and as statistical consultants to research programs on campus, in government, and in industry. The object is always to strike the right balance between mathematical necessities and practical constraints. An ideal handbook for the investigator planning a research program, the text comes complete with detailed plans of experiments and alternative approaches for added flexibility. FRANCIS G. GIESBRECHT, PhD, is Professor Emeritus in the Department of Statistics at North Carolina State University in Raleigh, North Carolina. He earned his PhD in Statistics from the Iowa State University. MARCIA L. GUMPERTZ, PhD, is a professor in the Department of Statistics at North Carolina State University where she also received her PhD in Statistics. 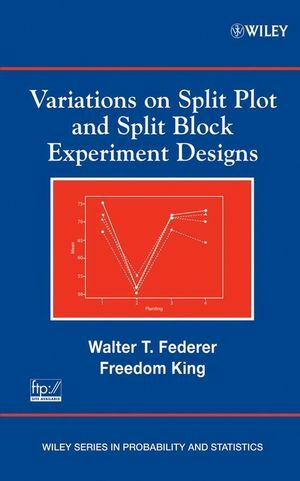 Linear Models for Designed Experiments. Testing Hypotheses and Determining Sample Size. Methods of Reducing Unexplained Variation. Factorial Experiments, the 2n System. Factorial Experiments, the 3n System. Analysis of Experiments Without Designed Error Terms. The General Pn and Nonstandard Factorials. Factorial Experiments with Quantitative Factors. Plans for Which Run Order is Important. Sequences of Fractions of Factorials. Orthogonal Arrays and Related Structures. Factorial Plans Derived via Orthogonal Arrays.